German historian; born in Dannenberg, Hanover, March 22, 1848. He studied history in Göttingen from 1866 to 1869; became teacher of the real-school in Frankfort-on-the-Main; afterward occupied a similar position in Berlin, and at the same time began his academic career as privat-docent in the university in that city. In 1877 he was appointed assistant professor at the same university, and in 1890 professor at the University of Strasburg, which position he still (1902) occupies. In 1887 he became corresponding member of the Munich Academy of Sciences. In 1888 he was elected a member of the board of editors of the "Monumenta Germaniae Historica," a publication which has for its object the collection of all the ancient sources of German history. For this series he edits the periodical devoted to its interests, the "Neues Archiv der Gesellschaft für Aeltere Deutsche Geschichtskunde." 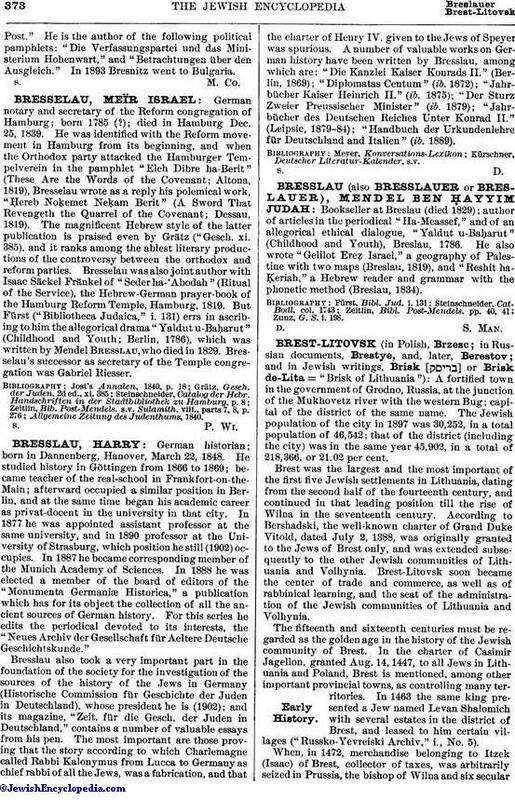 Bresslau also took a very important part in the foundation of the society for the investigation of the sources of the history of the Jews in Germany (Historische Commission für Geschichte der Juden in Deutschland), whose president he is (1902); and its magazine, "Zeit. für die Gesch. der Juden in Deutschland," contains a number of valuable essays from his pen. The most important are those proving that the story according to which Charlemagne called Rabbi Kalonymus from Lucca to Germany as chief rabbi of all the Jews, was a fabrication, and that the charter of Henry IV. given to the Jews of Speyer was spurious. A number of valuable works on German history have been written by Bresslau, among which are: "Die Kanzlei Kaiser Konrads II." (Berlin, 1869); "Diplomatas Centum" (ib. 1872); "Jahrbücher Kaiser Heinrich II." (ib. 1875); "Der Sturz Zweier Preussischer Minister" (ib. 1879); "Jahrbücher des Deutschen Reiches Unter Konrad II." (Leipsic, 1879-84); "Handbuch der Urkundenlehre für Deutschland and Italien" (ib. 1889).